While many would agree with the assertion that the Church of England possesses the oldest building stock in the country, arguably a major problem in itself, few ever consider the fact that the church also contains some of the country's oldest residents - in its churchyards. Locked beneath the visible gravestones, themselves so often the last survivors of more recent churchyard "tidying", lie the remains of thousands of unmarked, unnamed individuals whose resting-place is often the only undeveloped piece of land in a parish. Recently public interest in churchyards has been fuelled by a crop of archaeological television programmes, and parishes are increasingly aware of archaeologically-led DAC interest where graves have to be exhumed, due to the requirement for a faculty under the provisions of the 1991 Ecclesiastical Jurisdiction Measure. The information contained in the graves of any period is immense and takes many fascinating forms: osteological, demographic, liturgical and superstitious. To maximise its relevance to all parties, some selectivity must be employed, asking the right questions of the right material. Recently such questions have accompanied a massive redevelopment in the centre of the city of Coventry. The Phoenix Initiative is redeveloping a swathe of Coventry city centre, opening it up to public access for the first time in generations. Funded by the Millennium Commission, the European Regional Development Fund and Coventry City Council, the project has always been tied closely with the archaeology on the site, the presence of which was always known to Coventry Museum's Archaeology Unit. The main archaeological contract was awarded to Northamptonshire Archaeology, whose task was to uncover, record and analyse for public display the remains of the city's first cathedral, a medieval church that predated the one burnt out in the blitz of 1940. St Mary's Church was vast, 425 feet long, dating from the 12th century. It was demolished by Henry VIII in 1539, not only because it had a Benedictine Priory attached, but also because the double See of Coventry and Lichfield had two seats for one bishop; one of them had to go and St Mary's was declared surplus to requirements. The church and monastery were razed within a few decades, but their rubble-strewn plot remained a planning blight on the city for two centuries. In 1776 the area of the former nave and aisles of the ruined cathedral was re-consecrated as an overspill graveyard for the adjacent Holy Trinity Church, ironically once the parish church of the Benedictine Prior of St Mary's. The two had only ever been separated by a narrow lane and, when both were standing, had contributed to a skyline dominated by seven stately spires. Traditionally Coventry is known as the city of three spires, testament to how dramatic the dissolution of the monasteries had been in the urban psyche, that four had been utterly forgotten. For the next eighty years this new cemetery accepted little short of half the city's dead, those who were resident in the parish of Holy Trinity. At a time when Coventry grasped the ideas of the industrial revolution with a will, its inhabitants were predominantly involved in silk ribbon weaving and watch making. On these technologies and the new skills of its workforce were built the foundations on which the British car industry would later stand. The creation of the cemetery smothered the former cathedral ruins under an 8-foot blanket of imported soil, and before Northamptonshire Archaeology could excavate the cathedral, the problems this posed had to be addressed. This soil overburden amounted to 3,500 tons which were removed by machine under archaeological supervision to reveal a carpet of burials. Details of each articulated skeleton and associated coffin fittings were entered onto a GIS (geographically coordinated) database originally designed by Northamptonshire Archaeology staff for use by the United Nations Commission on war crimes in the former Yugoslavia (Bosnia). Following considerable adjustment for local conditions, this enabled the excavation team to work quickly and methodically to clear the graveyard while still retrieving the archaeological information which graveyard clearances so often lose. 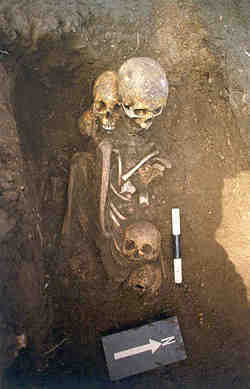 The total number of burials recorded and excavated was 1,706. 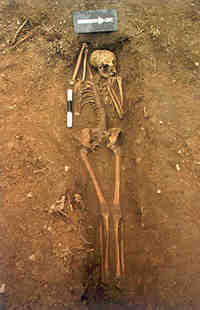 While some were orderly burials, others were massively intercut and stacked, leaving stray heads, arms or legs as the only articulated remains. Thirty-seven brick burial vaults were also located, of which eight had to be fully dismantled, recorded and excavated. A comprehensive health and safety risk assessment addressed unsavoury issues such as the potential for exposure to diseased human tissue, matters on which considerable medical opinion was sought. 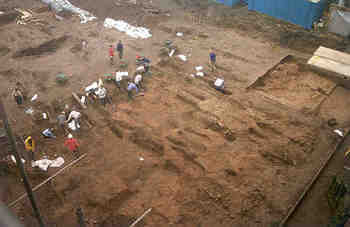 Any body with tissue surviving was reburied at a new site on the same day as its exhumation. Some burials from the vaults were even lifted with intact 150-year old coffins that had funeral wreaths still lying on top. Most remains, however, were entirely skeletal, the bones generally well preserved, unlike the coffin fittings, which were often in poor shape. Final resting places are often not final at all and while it was the wish of the Church and Coventry City Council that the bones should be eventually re-interred with all due sensitivity (and in pursuance of the relevant legislation), the 100 or so best-preserved skeletons, including a considerable number with accompanying coffin plates (containing valuable biographical data) warranted further research. These were sent by Northamptonshire Archaeology to the Department of Pre-Clinical Sciences at Leicester University's Faculty of Medicine and Biological Sciences, under an arrangement with the University. There Dr Jenny Wakely and a team of post-graduate researchers have begun a two-year programme of archaeological research on the bones, which will not only unlock their secrets but also provide the current medical staff and students with a temporary teaching collection of inestimable value. While this process is ongoing, a great deal can already be said from observations and records made on site. A skeleton contains in its bones part of the history of that person. All those events and processes which affected that person's bone may be preserved, such as deficiencies in their diet, childhood illness, congenital abnormalities and injuries. Where any or all of these are evident the question also arises of how did past societies deal with them? What physical evidence do we have of the medical response of the day? As a cemetery covering the period 1776-c1850, Holy Trinity's straddles the rise of modern medicine and the last of more ancient surgical procedures. Thus the same sample produced an example of an unsuccessful leg amputation, the patient having died with no evidence of healing on the remaining femur, together with four instances of early autopsies. These indicate that the more rudimentary massive interventions which had been largely unchanged for hundreds of years continued in use while the medical profession searched diligently for knowledge which today our society tends to take for granted. Those burials which were accompanied by surviving coffin plates provide biographical details of the individual, the date of death and their age at death. These details are of immense value since they can be used to check standard techniques of ageing skeletal material, notoriously difficult once a person reaches adulthood. Previous studies have shown the old techniques to be embarrassingly inaccurate in a significant number of high-profile cases. Biographical data from 1841 onwards can be matched with the first national censuses to extract information on where a person lived, their family, their occupation, their place of birth. In addition, at about the same time the law began to require physicians to issue death certificates, another indicator of the state of medical knowledge. It is of great value to know that a significant proportion of the individuals in the study sample both died after 1841 and were accompanied by legible coffin plates. Such a body of data will have information to yield going well beyond the ordinary. The design and inscriptions on memorials and gravestones usually provide a fascinating source of information but, at Holy Trinity, previous clearance and building work since the 1960s had removed all but six gravestones. Many more remained on site being stacked in buried piles or lined up against walls , but as no graveyard plan had survived the gravestones could no longer be related to their graves.They showed that an architect, a solicitor, even a surgeon were all buried there, as was at least one murder victim of 1844 whose end was documented in the contemporary press. In the last instance identification was not possible as the person's grave could not be associated with a particular body. One grave in particular caused a stir. The individual, probably buried in the 1840s, lay supine but with his or her arms grotesquely flexed in a position of great distress, unable to struggle beyond the confines of the coffin. It is possible that the person may have been comatose when interred. Victorian documents do record a contemporary fear of being buried alive, an unconscious awareness preventing communication in any recognisable form, so-called catalepsy. Elaborate remedies of the day included bells and pulleys rigged up to be rung at any time up to the funeral. This unfortunate individual may have been awoken briefly by a drop in temperature or the exhaustion of the air supply. Along with many of the pathologies observed on site, such as tuberculosis and rickets, it left the excavators with a healthy respect for modern medicine. While the report and processing of the project has many months yet to run, it serves to illustrate just what a variety of information can be produced by an excavation, of value to more than just archaeologists and certainly of interest (although occasionally macabre) to a wide section of society. Balancing the costs of excavation against the value of information potentially lost is always difficult but this excavation of a city centre site illustrates one compromise which has far surpassed expectations. 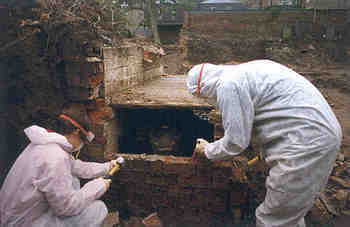 To mitigate the loss of information by excavation is generally accepted as an option in secular planning, and this approach is now being adopted more widely where churches are concerned due to the provisions of the 1991 Ecclesiastical Jurisdiction Measure - most churches being exempt from usual listed building requirements. While the structures of the church must continue to reflect the sense of mission of its parishioners, can the churchyard do the same, relating only to our past, particularly those churchyards which are closed? The challenge facing anyone interested in the alteration or investigation of churchyards in this new century is to walk a tightrope between respecting the secular world which continues to look upon them as picture-postcards of immense historic importance, and respecting the Mission of the Church which targets the living. It might be asked whether the partial or total loss of a graveyard detracts from the historical setting of a church. If the church is no longer in use then the whole may indeed be considered a museum-piece; moreover our many picturesque churches would look very different surrounded by anything other than a churchyard. More and more we are seeing moves to make use of churchyards for more than just the disposal of the dead, a responsibility passed more widely to local authorities as both attitudes to the Church and the need for more burial space have changed. Good stewardship of our churches is becoming a minefield. As more and more congregations rediscover their evangelical roots we can expect to see more and more searching questions regarding our relationship with our built Christian heritage and Christian attitudes to the past when faced with its relevance to the Great Commission. This particular church, Holy Trinity, will be open to wider public view for the first time in many decades. The project has provided a new Church Centre, while an interpretation centre will bring many more visitors into its sphere; with that will come greater opportunities for Christian witness. For the city at large there will now be greater public access to what was previously a concrete morass of car park, old boundary walls and enclosed yards but is becoming a tourist-centred boulevard and garden in the midst of the medieval city core. The price is the church's physical loss of the historic link with an area of its churchyard, part of its archaeology and its dead parishioners.